Makeup can make or break your face and therefore the right makeup products work wonders in ramping up your look. L'Oreal makeup has some of the finest makeup essentials from eye mascaras to eye liners and palettes for better face framing. Do not miss the expert tested and reviewed products that call for their long staying power and blends into the skin like magic. Makeup is a go-to way to wear a second skin and accent your face for maximum expression. Wearing it is always for good as it defines your flawless features and captivates the attention. Experimenting with it is same ways creative and fills in new energy. TJC gets the vibe and brings in some IT makeup essentials for the discerning women of today. The one brand that empowers women to bring the maximum of it is L'Oreal make up products that undoubtedly have accumulated much love and reviews. Mascara is the quintessential makeup product to give the eyelashes the curl it is in dire need of. These are long lasting and give an intense look to the eyes. The million lashes or false lash sculpt mascara sets the tone for a brilliant product for a beauty connoisseur. The loreal voluminous mascara gives a blow of energy to eyes and makes it nothing less than a dream. Having perfectly defined eyes with the magic of eyeliner is always goals. Every new age woman would love to embrace the beauty of their eyes with a stroke of eyeliner and L'Oreal brings in the perfect super staying powered eyeliner that effortlessly defined eyes. L'Oreal is one brand that is doing everything to cater the need and want of women globally. 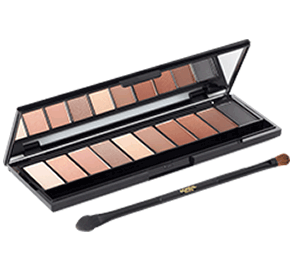 With its eye makeup palette, cover concealer palettes, and several other trusted products, the brand is reinventing to amp up the beauty in every way. Now elevate your dolling up goals with L'Oreal products that fill in the loops and call for an unrestrained indulgence to let your makeup be on point. Shop the wide range of products and haul for some must have makeup essentials from L'Oreal only from TJC.